Another new machine was added in May 2012: a new hand-crank machine at The Living Seas. 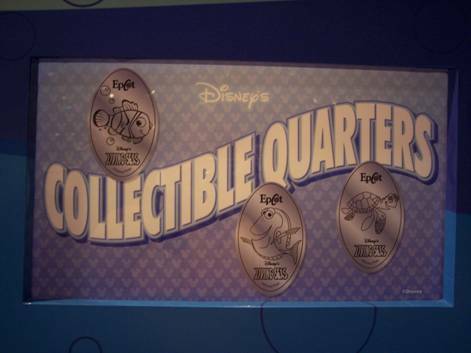 The four designs are scuba Mickey; Nemo, Marlin & Dory; seagulls from Finding Nemo; and Crush & Squirt. 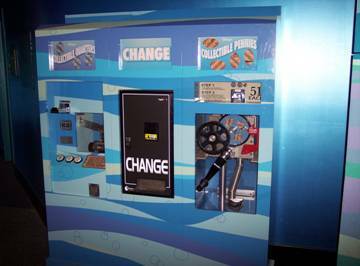 The penny press machine has been combined in a cabinet with the quarter machine and a change machine. 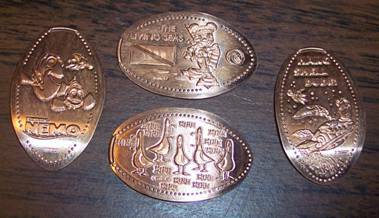 The quarter machine originally said “pressed pennies” and showed copper-colored designs on the display board of the quarter machine, but by June 18 the faceplate had been changed to show “quarters” and the proper silver-colored coin designs. It is located in the gift shop at The Living Seas.